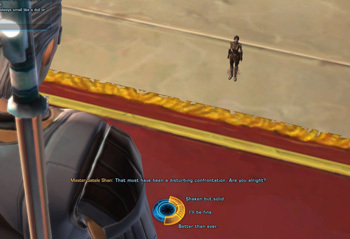 Analyst: Concerns About The Old Republic's Performance are "Overblown"
According to one market analysis group, people badmouthing the The Old Republic's sales performance are pulling numbers out of thin air. Yet despite all that, EA's stock has dropped by nearly 30 percent since the same time last year, partly due to what one analyst described as "creeping concerns" over The Old Republic's sales performance. According to a report from market analysis group Macquarie Securities, "creeping," in this case, means "exaggerated." Ben Schachter, an analyst working for Macquarie, points out that his peers are basing their predictions on conjecture rather than actual data. He goes on to add that the fact EA hasn't released any sales numbers for The Old Republic doesn't necessarily mean sales of the game have been poor. He accounts for the game's slow performance at retail, as tracked by the NDP, by claiming that the majority of initial sales may have been made through EA's digital distribution service, Origin. Webush, another market analysis firm, agrees. The group reckons that more than 800,000 copies of The Old Republic were sold via Origin, and that EA is on track to have sold 2 million copies by the end of the year. Of course initial sales aren't the most accurate measure of an MMO's success. The game's subscriber retention will be put to the test over the coming months. The Old Republic will have to hold on to a large percentage of its estimated 1.5 million subscriber base if it's to prove profitable, given its immense budget.